New data from the National Grid reveals that 2015 was a record-breaking year for wind energy generation, with onshore and offshore wind farms setting new weekly, monthly, quarterly and annual records. According to the figures, 11% of the UK’s electricity was sourced from wind power in 2015 – up from 9.5% the previous year. Overall, wind provided enough electricity to meet the demands of more than 8.25 million homes – almost a third of UK households – compared to 6.7 million homes in 2014. Commenting on the figures, RenewableUK’s director of policy Dr Gordan Edge said: “This is a great way to start the new year – the wind industry can be proud that it has shattered weekly, monthly, quarterly and annual generation records in 2015. This re-writes the record books. We’ve had a bumper harvest thanks to increased deployment and superb wind speeds. “It also demonstrates why the Government should continue to support wind energy, as we’re delivering on our commitment to keep Britain powered up. We can continue to increase the proportion of the nation’s electricity which we provide as we move away from fossil fuels to clean sources of power." With more people at home over the Christmas period and colder and darker days creating more demand for energy, December 2015 set new a new monthly record for wind generation, with wind power supplying 17% of Britain’s increased electricity demand. December also saw a new weekly record, where in the last week of the month – including Christmas – around 20% of electricity demand was sourced from wind energy. Quarterly records were also set during the three month period from October to December, with 13% of electricity demand met by wind, beating the previous record of 12% set in the first quarter of 2015. 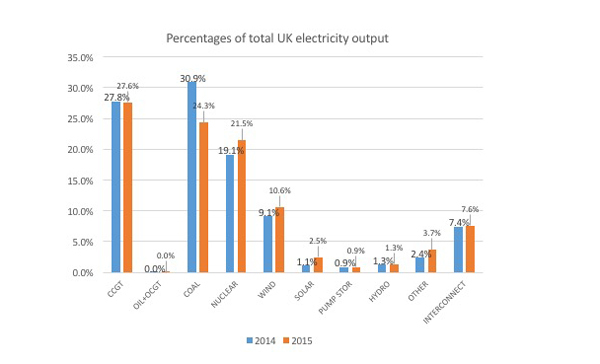 In total, renewables such as wind, solar and hydro accounted for more than 18% of all UK electricity in 2015, up from slightly less than 14%. This represents a rise of 31% in the share of total generation. The proportion supplied by gas, oil and coal fell from 58.7% to 52%. RenewableUK stated that wind energy drove £1.25bn of investment into Britain's economy last year, with the industry now employing 30,500 people. The European Wind Energy Association has also stated that wind energy could be the largest power supply source in the EU by 2030 as long as governments drive ambition in climate and energy policies.